This year has been off to the best ever start for us. Our final part to complete our family arrived on 2nd January. We couldn’t be any happier and every time I look at her my heart is bursting with love, joy and pride. 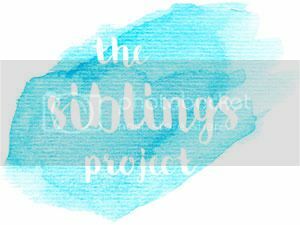 I’ve been following The Siblings Project for a while now and couldn’t wait to finally be able to take part. I love the idea of taking pictures of the children each and every month. Documenting their growth and relationship to one another will make for such great memories to look back on in years to come. My older girl (it still feels weird to write this as she was our little girl for so long) has been ever so good. Ever since we found out that we were expecting, she was over the moon. She would kiss the bump, sing to it and stroke it on a regular basis. Her anticipation of becoming a big sister has been immense. We weren’t sure whether she would still react like this when baby was here, but we didn’t need to worry. She is the perfect big sister! Yes, sometimes we do have to tell her to be careful and that the baby isn’t a toy. She would love to hold her hand and stroke her constantly, but babies do need (at least) some sleep. We took these pictures yesterday and they mean so incredibly much to us. Seeing the love and admiration of our older girls face is so touching. Our baby girl has fitted into our family so nicely and it feels as if she has always been here. Makes my heart sing too Heidi! Looking forward to seeing your posts each month. Oh how exciting a new addition to the family and a new relationship to witness and watch blossom this year on #siblingsproject. These are adorable snaps of your two beauties. Thanks so much, Jenny. I cannot wait to snap pictures of them monthly. Congratulations on your lovely little girl (and the lovely ‘big sister’). Will look forward to seeing your pictures as they grow. There’s something magical about night time feeds. You just have to remember to grab some sleep whenever you can Enjoy!! !